Three Council Bluffs neighborhood associations have been busy in recent years doing “everyday” things to preserve the historical charm of their area. Their efforts didn’t go unnoticed. On Thursday, they were awarded the 2013 Preservation Award by the Council Bluffs Historic Preservation Commission. The commission recognized the Fairmount Park, Gibraltar, and the Lincoln Fairview associations for doing “everyday things that people can do,” as one city official said. “We want to recognize the efforts of neighborhood associations to preserve their neighborhoods,” said Cal Petersen, chairman of the historical commission. The Fairmount Park Association, according to Petersen, oversaw the renovation of the grandstand at Kirn Park, sponsored clean-up days, gave tours of the homes in the neighborhood that underwent restoration, purchased historical banners for street poles, etc. The Gibraltar association helped the Fairmount group restore the brick streets, as well as helping with the Kirn project. It even purchased a security camera to be placed there to discourage vandals. It also sponsored fundraising events for the historic General Dodge House, and even publishes a frequent newsletter to keep residents informed on projects. The Lincoln Fairview association purchased street sign banners for Oakland Avenue, as well as benches for the Lincoln Monument and a security camera for the Black Angel statue. That group also publishes a newsletter. This Saturday, May 26th, the FPNA will be hanging flower baskets on the poles through the Park, Glen, Huntington, and High School streets. Michelle Mutchler-Burns will be watering again this year, however, feel free to take of them near your house as needed. Please Join us on Sunday, June 10th from 1pm-5pm for a lovely tour and stroll around some very historic neighborhoods! Please see attachment for more information. “I discovered tonight that our garage was broken into sometime in the past several days, and one of our bikes was stolen. We weren’t aware of it until tonight because we’ve been unable to use the garage due to some pending work on the supporting retaining walls, so it could have occurred any time in the past week or so. We suspect the break-in may have been related to some recent siding repairs we had done, as I saw one of the workers looking around the garage one day – nowhere near where any repairs were needed. We found a cell phone charger that was apparently dropped in the process of crawling in or out of the garage window, so if the police pursue this, we may have something to go on. 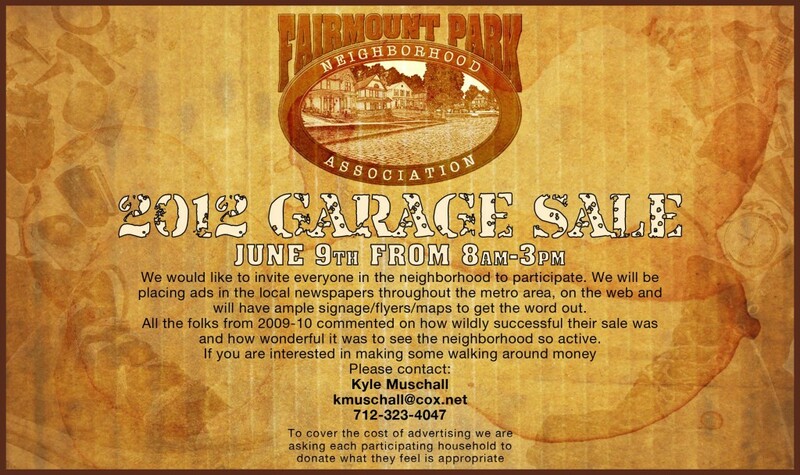 I wanted to send out another reminder that we are still looking for participants for the 2012 FPNA Garage sale. We have 8 locations so far but would like to get some more. So if you have unused items piling up in the basement or garage and would like to earn some extra cash please contact me at the information below and I will add you to the list. 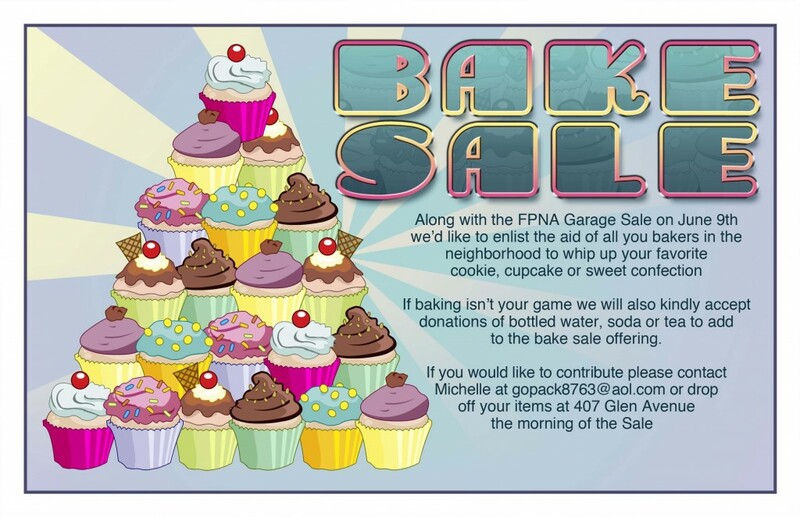 We will also be having a bake sale that day so if you aren’t able to participate in the Garage Sale think about contributing that cookie, brownie or sweet treat you are famous for to the bake sale effort. The Design Committee for the Downtown Flower Project will begin our flower planting in the downtown area on this Saturday at 10 AM. We will have a flatbed trailer with mulch and flowers, also a truck with a watering tank. Sherbondy’s is selling us “Wave Petunias” at a discount. Larry Foster (Parks Dept) has indicated that the City may be able to provide us some planting materials as well but I do not know the quantities or types yet. I will bring as many shovels and implements as possible, gloves, and bottled water. We will probably not get it all done but will do what we can do for the day. If those interested will perhaps recruit helpers and bring more tools let me know who might be coming, that would be appreciated.